For high school senior Whisper Bentley, softball is everything. But the first base woman returned to school this week to find that thieves, over the summer, had stolen all of the aluminum bleachers on campus. "It was really surprising," said Bentley. "I don't know why somebody would do that when it costs us so much money, and this is our only facility at this school." Apple Valley’s Academy for Academic Excellence is a charter school just off Highway 18, near Victorville. Metal thieves somehow gained access to the closed campus in July and made off with about $6,000 worth of school bleachers. "We'll have to raise funds," said Principal Gordon Soholt. 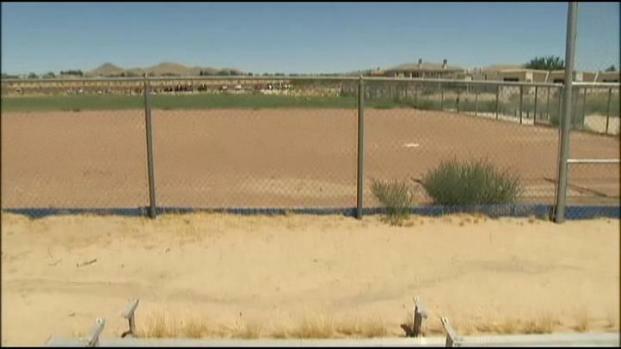 "We'll go to the community and do whatever we can to build these back up for softball." The scrap metal thieves who hit the school probably didn’t realize they were stealing from kids who’ve managed to make it to school playoffs four years in a row. Or that the stolen bleachers were only worth a few hundred dollars in scrap. They're worth a lot more for their intended purpose. "I don't think they realize what they've done," said Athletic Director Scott Gormley. "I don't think they realize what it means to the kids who go here, our student athletes. They're probably going to get a few hundred dollars at a metal recycling place, which is nothing." The Academy for Academic Excellence is no different than countless other places across the country where thieves, trying to make a quick buck, have stripped copper, brass, bronze or in this case aluminum. Catalytic Converters, which fight auto pollution, have also been targeted because of their small platinum content. One parent at AAE has started a fundraiser to replace the bleachers, while a high desert home improvement store even offered to help. For now, players like Whisper Bentley are trying to raise money so fans will have a place to sit in time for the season opener.